In this part we will explore the meaning of the 44th Shloka of Sri Vishnu Sahasranamam. Bhagavan is the remover of obstacles to Liberation or Moksha. He is the Creator and dwells within each one of us as Antaryami. He is the Life force within us and the life giver. He is the Supreme Being, hence worthy of worship for his great acts and is invoked with the Pranava Mantra ‘OM’. As the Creator of Cosmos He is well known and resides in the heart of his devotees and destroys their enemies. He is full of love for his devotees and is easily attainable. He moves within us like wind and remains undiminished and is complete even after creating the Cosmos. Meaning: By me the Earth was United with water, ether with air, and air with fire. So I am called Vaikunthah’. Sri Parasara Bhattar derives the meaning from the root ‘kuthi gati praghaate’ meaning obstructing the path. Kunthaa signifies the obstacles to Union with the Lord. Thus, Vaikunthas are those whose obstacles have been removed. The obstacles to Bhagavan are sins. 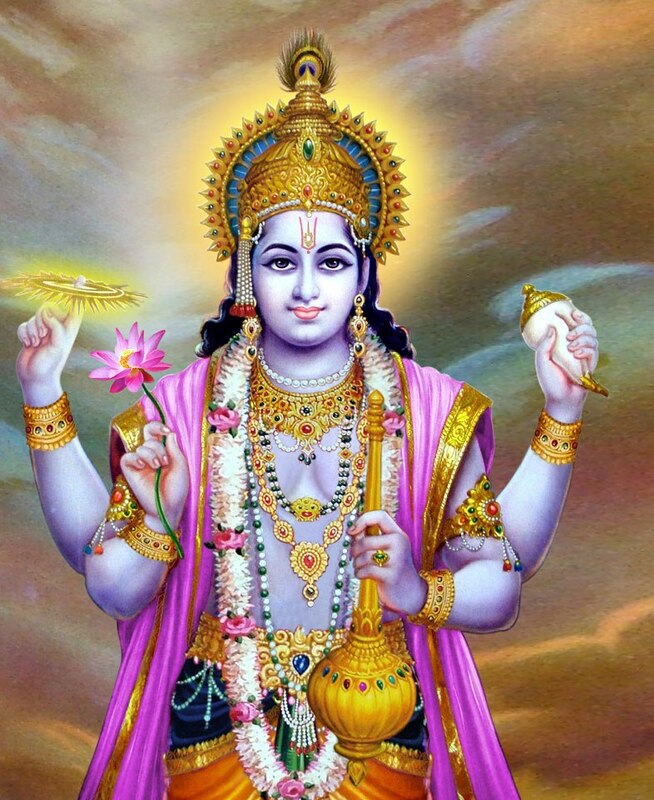 As He is the remover of sins, He is called Vaikunthah. Sri Radhakrishna Shastri explains the Nama as Vigataa kunthaa tasyaah kartaa – One who regulates those that tend to go their own way if left unobstructed. Sri Shastri gives yet another explanation. Bhagavan is called Vaikunthah because He was born to Subhra and Vikuntha in the fifth manvantara. He then married Lakshmi and acceded to her request to create a place for her enjoyment, and this place was called Vaikuntha. He Himself is this Vaikunthah. This view is supported by Vishnu Puranam and Srimad Bhagavatam. Sri Annangaracharya says He is Vaikunthah also because He removes all obstacles to attaining Him for His devotees, and unites them with Him. Sri Satyadevo Vasishtha explains that One for whom all obstacles or obstructions (kuntha) have been removed is Vaikuntha. And the One who removes all obstacles is also Vaikunthah. The Dharma Chakram writer takes the interpretation to a level where it applies to the lives of individuals for whom He removed the obstacles and United them with Him. Puru sanoti iti purushah – One who gives in plenty. Pura Asti iti purushah – One who existed before anything else. Poorayati itit putushah – One who complements and fulfils existence everywhere. Sarvapaapasya saadanaat – He burns away all sins. Parishayanaat Purushah – He is in deep sleep within the bodies of all beings. Sa yat poorvo asmaat sarvasmaat sarvaan Paapmanah Aushat tasmaat Purushah (BU 1.4.1) – He is Purushah because He existed before all and he burns away all sins. Sa vaa ayam Purushah Sarvaasu Poorshu Purushayah (BU 2.5.18) – He sleeps in the interior of all beings’. Sri Parasara Bhattar gives the interpretation to this Nama as One who burns all sins (Oshah) by nature – Sa Yat Purvah Asmaat Sarvasmaat Paapmana Oshah Tasmaat Purushah. Usha Daahe Puroon Sarvaan Oshati Dahati iti vaa Purushah – He who outshines everyone. Piparti prnaati paalayati poorayati iti vaa purushah – He who protects and nourishes -from pri paalana pooranaayoh. Purah + kushan (Purushah from pura agragamane) – Pura agragamanepurati agragaamI bhavati iti vaa purushah – He who is the Leader or who is in the forefront. Poorvah Asmaat Vishvaat tat Aadikaaranatvaat iti Purushah – He who is the original cause of the world. Puruni Bhuvanaani Samhaara Samaye Syati Antam NayatIti Purushah – He who takes the worlds to their end at the time of Pralaya. Meaning: Padmanabha is the mighty one, higher than the highest. He is my Kalpa tree, he made me His and Himself mine. He is my ambrosia, dark as the rain cloud, in Venkatam. 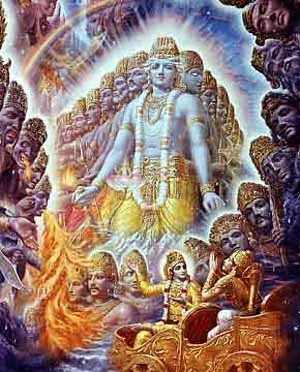 My Lord Damodara is the Lord of high celestials too. Praaniti Kshetrajna roopena iti Praanah – He enlivens the body in the form of awareness or consciousness of the external world. Praanaatmanaa cheshtayan iti vaa Praanah – He gives movement to the body in the form of life-giving air or oxygen. While the first meaning refers to cognitive activities, the second refers to physical activities of all living beings. Bhagavan as Praanah is the source for both. Vishnu Purana says ‘Cheshtaam Karoti Shvasana Svaroopi – He makes movements possible in the form of life-giving air’. Sri Radhakrishna Shastri refers us to ‘Yad-vai Praaniti sa Praanah – He enlivens us, so He is Praanah’ (Chandogya Upanishad 1.3). Karpaar Rama Piraanai Allaal Matrum Karpaaro? Meaning: In the blessed Ayodhya, in the land created by Brahma, down to the smallest insect without exception, He gives an exalted place to all the sentient and the insentient, so would any scholar study about a King other than Rama? This Nama occurred earlier (66, 323), and will recur as Nama 956. · Praanaan Deepayati – He who purifies and brightens the Vital Airs (Sri Sankara). Here Sri Adi Sankara gives the meaning ‘Khandayati Praaninaam Praanaan Pralayaadishu iti – He stops the vital airs from the living at the time of the final deluge’. The difference between this meaning and the one above is that here Sankara is referring to the end of the world whereas he was referring to the individual death of a person. This Nama also has been interpreted to Bhagavan’s ability to give the Nitya-Suris (Ever-free Angels) to enjoy Him constantly, which is the sustenance of their life. The Dharma Chakram writer points out that when Bhagavan gives life in the form of Sun, the beings that are exposed to this light are livelier compared to the beings that do not get exposed to the Sun. Similarly, those who realise Bhagavan are in an awakened and energised state than those who merely identify themselves with their body. His Mantra Svarupa awakens the spiritual light in those who chant the Gayatri Mantra, and this in turn leads to God realisation. ‘Pranamyate iti vaa Pranavah – He is fit to be worshiped hence He is Pranavah’. He gives a quotation from Sanatkumara which is ‘Pranamanti iha vai Vedaah Tasmaad Pranava Uchyate – Prostrations are made for Him in the Vedas’. Meaning: .O my heart! There is no other companion or protector for us other than the one who prevailed over Isan. 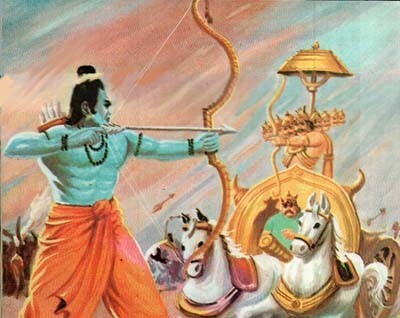 The red-eyed adorable Lord Rama who took the Vishnu-bow from Parashurama, killed the unrelenting ten-headed King Ravana and razed the city of Lanka with his fire-arrows. Except for Lord Rama, there is no one else fit for us to worship. Sri Adi Sankara gives the interpretation for this Nama as ‘Prapancha Roopena Vistritatvaat Prithuh – He is spread throughout the Cosmos (in his Cosmic form)’. Teshaam atiyashe loko Raamah (Bala 77. 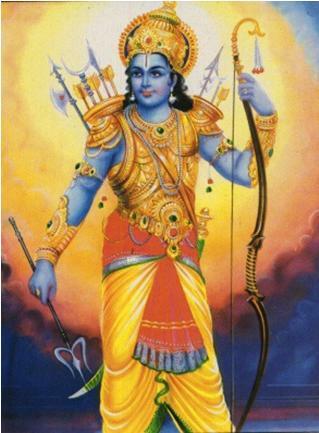 28) – Amongst them Rama was the most reputed. Sri Satyadevo Vashishtha gives the explanation for this interpretation – ‘Prath vistaare – to spread out, to expand’. The Vishvaroopa of MahaVishnu is an example of Prithuh in both senses – He who is well-known through His Viraat Svaroopa or He who is spread throughout the Cosmos in His Viraat Svaroopa. Sri Radhakrishna Shastri gives an additional interpretation – In His ninth incarnation as Krishna, He takes the form of Prithu Maharaja who is the father of Prithvi. This is described in Srimad Bhagavatam 1. 3. 14 – Rishibhir-yaachito Bheje Navamam Paarthivam Vapuh – In response to the request from the Sages, He appeared in the form of Prithuh. Sri V.V. Ramanujan refers to Divya Prabandham – Nigar il pugazhaai – (Thiruvai Mozhi 6.10.10). · He who is the originator of all that is the object of fulfilment or joy. Hiranya refers to gold.The analogy here is that just as gold is pure, attractive, lustrous and highly coveted, so is Parama Padam which is Shuddha-Sattva, and hence the reference to Hiranya. One who generates all that is great is Hiranya-Garbhah. Sri Adi Sankara interprets this as ‘Hiranyagarbhasambhooti Kaaranam Hiranmayamandam himself is the Creator of the whole World’. 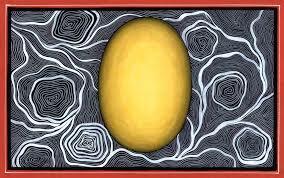 Hiranya refers to the Veerya or the energy that He had in Him and that resulted in the Creation of Brahma, the Creator. There is another explanation for the Nama that is given by Sri Radhakrishna Shastri. Just as gold is hidden in the heart of the earth, He is hidden in the hearts of His devotees. He is Hiranyagarbhah in this sense as well. Sri Shastri gives a connected account of the Namas starting with Vaikunthah and ending with Hiranya-garbhah in terms of Creation. Bhagavan as Vaikunthah who removes obstructions and wih His enormous energy, descended from His state of Parama Purusha and decided to reside in the beings in this Universe in the form of Purusha in the body as if it is Vaikunthah. Then, He converted the Prana Shakti which operates the Prakriti into a form which supported the beings, and thus became Praanadah. This resulted in this Universe, the Akaasha being the first of the bhootas (Tasmaad-vaa etasmaad Atmana Akaashas Sambhootah). First there resulted the great sound of Pranava i.e. 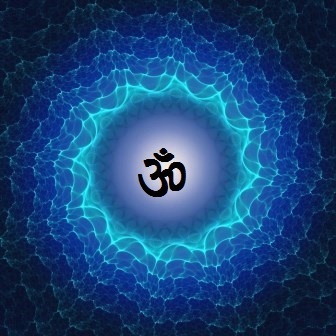 ‘OM’. From this Akaasha, and then there resulted the other Bhootas like Wind, Fire, Water and Earth and thus He expanded into the Cosmos (Prithuh). This Prithuh is the Father of this Universe. Prithvi is the daughter of this Prithuh. Starting from the Gross (Sthoola) form, and following through with the bestowing of the Subtle (Sookshma) form, He then gave the Praanamaya, Manomaya, and Vijnaanamaya Koshas to His Creations as Hiranya-Garbhah. Thus, starting from the Nama Vaikunthah, and up to the Nama Hiranya-Garbhah, the secret of Creation is unfolded step by step. Though the basic meaning is ‘Shatroon hanti iti Shatrughnah – He exterminates his enemies’, Sri Adi Sankara imodifies this as ‘Tridasha Shatroon hanti iti Shatrughnah – He exterminates the enemies of the Devas’. The reason is that Bhagavan has no enemies personally. He is Samaatma. Sri Parasara Bhattar points out that He subdues the senses that lead people away from the enjoyment of earthly pleasures by His arrows of wisdom – Satrum hanti iti Shatrughnah. When one mediates on Him, He slays the enemies in the path to the devotees’ realisation of Him. The mind can be like Ravana’s ten heads when left unchecked and is compared to the ten sense-organs over which one has to exercise control. Ravana’s ten heads are also interpreted to mean the ten attributes over which one needs to gain control in order to realise Him Viz. Kama (Lust), Krodha (Anger), Moha (Delusion), Lobha (Greed), Mada (Pride), Matsarya (Envy), Manas (the mind), Buddhi (intellect), Chitta (Will) and Ahamkara (the Ego). Sri Satyadevo Vasishtha interprets the Nama as referring to His act of punishing those who violate His dictum. Sri Adi Sankara interprets this as ‘Kaaranatvena Sarvakaaryaanaam Vyaapanaat Vyaaptah – As the primary cause for every action He pervades every activity and every material object hence He is Vyaaptah’. He is all-pervasive both in the world of objects and in the world of ideas. As Narayana Suktam says ‘Antar bahishcha tatsarvam Vyaapya Narayanah Sthitah – Narayana pervades all, both inside and outside’. Also we have ‘ripoonaam api vatsalah’ – Rama is affectionate even towards His – Yuddha Kandam 50.56. Another interpretation given is that He pervades everything (Sri Sankara, Swami ChinmayAnanda, Sri Radhakrishna Sastri). Sri Adi Sankara interprets this ‘Vaati gandham karoti iti Vaayuh – He is Vaayuh because he carries scents or fragrances everywhere’. In the Bhagavad Gita (Chapter 7 Verse 9) Bhagavan says ‘Punyo Gandhah Prithivyaam cha – I reside as the auspicious fragrance on Earth’. Sri Parasara Bhattar says that He is called Vaayuh because He Himself goes seeking His devotees wherever they may be. Some examples are His going to Shabari seeking her with respect, His visit to Bharadvaaja in his Ashrama, His friendship with Guha etc. Sri Satyadevo Vashishtha gives the derivation – Vaati sarvatra gato bhavati iti Vaayuh – Vishnuh – He is spread out everywhere in this Universe. There is no place in this world where air has not entered or does not exist. This Nama signifies Bhagavan’s Omnipresence. Swami ChinmayAnanda points out that He is not just ’Air’ but He is the life-giving force behind the ‘Air’. Sri Radhakrishna Shastri refers us to the Aitreya Upanishad 1.7 – Vaayurasmai punyam gandham Aavahati – Bhagavan is the antaryaami for Vaayu, and makes Vaayu perform its functions as described in the various Upanishads. Vaayurvai gautama tat-sootram, vaayunaa vai gautamasootrenaayam cha lokah parashca lokah sarvaani cha bhootaani sandribdhaani bhavanti (Brihadaranyaka 3.5.2) – This means ‘Vaayu is the thread that keeps this world together like a string holding the beads of a chain; without this the world will break apart like a chain with a broken string; Bhagavan is this force. Yo vaayau tishthan-vaayorantaro yam vaayur-na veda yasya vaayuh shareeram yo vaayum antaro yamayati, esha te aatmaantaryaamyamritah (Brihadaranyaka 3. 7. 7. ) – He who inhabits the air but is within it, whom the air does not know, whose body is the air, and who controls the air from within, is the Internal Ruler, your own immortal self. Kim tad-Vishnor-balam Aahuh |Vaataat-Vishnor-balam Aahuh (Taittiriya 1. 8. 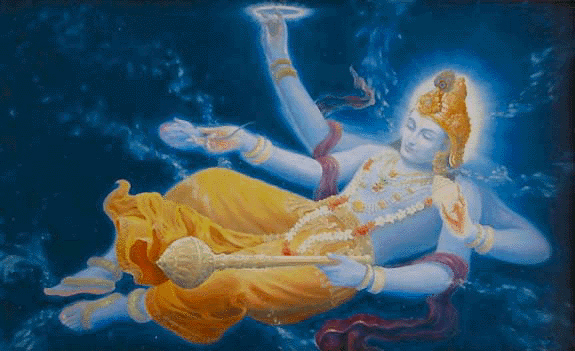 3) – Bhagavan Vishnu bears the earth through His Vibhooti as Vaayu. The Dharma Chakram writer reminds us that this Nama emphasises Bhagavan’s nature of being all-pervasive. We can survive without food or water for a few days, but without Vaayu we cannot survive even for a few minutes. Similarly we cannot survive without Bhagavan’s divine grace. Vaayu comes to us without our seeking; so does Bhagavan – He seeks His devotees and goes after them. Vaayu does not distinguish between people in any way; so does Bhagavan mingle with everyone with equal disposition. Thus Vaayu with its vital role in the existence and survival of this Universe is the reason for Bhagavan’s name as Vaayuh. Purandara Dasa was born to a pious couple Varadappa Nayaka, who was a wealthy merchant, and his wife Leelavati in 1484 CE in Kshemapura, near Tirthahalli, Shivamogga district in Karnataka. He was named as Srinivasa Nayaka, after the Lord of Thirupathi. He received good education in accordance with family traditions and acquired proficiency in Kannada, Sanskrit, and sacred music. At the age of 16 he married Saraswati Bai, who was kind and a pious young girl. He lost his parents when he was 20, thereby inheriting his father’s business of gemstones and pawn broking. He prospered well and came to be known as “Navakoti Narayana” (abundantly rich man; owner of nine crores). Srinivasa Nayaka was not drawn towards the spiritual path. He continued with the family business and increased it multi-fold. However, unlike his father, he was a miser, while his wife, Saraswathi Bai, was very generous and charitable much to the displeasure of her husband. Lord Vishnu apparently thought that it was time for Srinivasa Nayaka to give up his love for money, and take his rightful role among Saints. So, He took the form of a poor Brahmin and approached Srinivasa Nayaka for money in order to perform Upanayanam (Thread ceremony) of his son. Nayaka refrained from helping him and the Brahmin too did not relent. He visited Srinivasa Nayaka’s shop repeatedly seeking help. Six months passed by but Srinivasa Nayaka did not concede. Finally annoyed, Nayaka decided to get rid of the Brahmin. He had a collection of old antiquated coins that were worthless and spread them in front of the Brahmin and asked him to take one of them and not to bother him again. The Brahmin left with a crestfallen face. Saraswathi Bai was a kind hearted soul who tried to make amends for her husband’s miserliness. The Brahmin was aware of her generosity, went directly from Nayaka’s shop to his residence. He told her his story and how her husband had sent him away with just an old worthless coin. Saraswathi was appalled by her husband’s behavior and wanted to help the poor Brahmin, but felt helpless as she could not give anything without her husband’s knowledge. When she explained her helplessness, the Brahmin asked if she had something given by her parents which presumably she could give it to him without his consent. She agreed and gave him the diamond nose-stud that her parents had given her during her wedding. The Brahmin took the ornament straight to Srinivasa Nayaka’s shop. Nayaka became aggravated seeing the Brahmin coming back despite his instructions to the contrary. The Brahmin clarified that he was not there to beg, but to pledge an ornament and take a loan. Nayaka was skeptical and asked the Brahmin to show him the ornament. When he saw the ornament, he was shocked because he immediately recognised it as the one belonging to his wife. When questioned about the ornament’s antecedents, the Brahmin told him that it was a gift from a benefactor. He asked the Brahmin to come back the next day. Nayaka safely locked away the ornament in a box and went home. When he saw his wife without her nose stud he questioned her about it. She tried to stall him with non-committal answers, but he demanded to see it forthright. He was infuriated because he thought that she had given away a valuable ornament. Saraswathi Bai was petrified that her husband had found out and he would rebuke her if she admitted to the truth. She prayed to Lord Krishna to save her from the precarious situation. The moment she opened her eyes she was overwhelmed to see her nose stud sparkling in front of her. Her eyes were filled with tears of gratitude; she prostrated before the idol of Sri Krishna and took the ornament to her husband. Nayaka was astounded as it was the very same ornament that he had safely locked away in his shop. He quickly excused himself and rushed back to the shop to check. The box in which he had safely locked away the ornament was empty now. He was now completely and totally aghast. He went back to his house, and pressured his wife to tell him the truth. She told him everything that had transpired. This put his mind into turmoil. After deep thought, he came to the conclusion that the Brahmin was none other than Lord Vittala, his family deity. He recalled all the incidents that had transpired in the previous six months. He was disgusted with himself for his miserliness. There was a complete transformation in him. He felt that his wife had conducted herself far more bounteously than himself. Since it was his love for money that had made him ill-treat the Lord, he gave away all of his wealth instantaneously without a second thought chanting the Lords name. 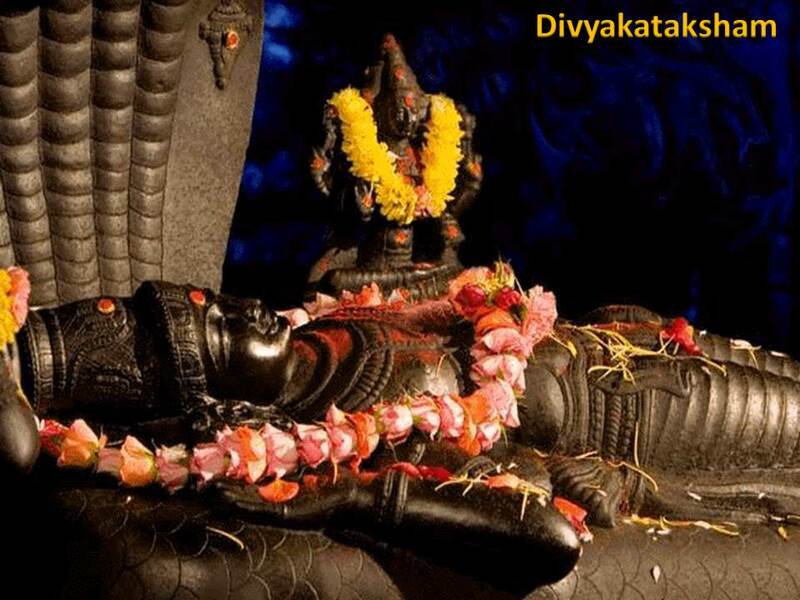 From that day he became a devotee of Sri Hari, Navakoti Narayana now became a Narayana Bhakta; the hands which sported gold and diamond rings now played the tamboora, the neck which used to be resplendent with gold chains now housed the Tulasi Mala. The man who had turned away countless people away, now himself went around collecting alms and living the life of a mendicant. In his very first song composition, he laments his wasted life of indulgence. It begins with the words ‘Analaekara unni poladi sakala shaastra puraana deenam’ in the Shuddha Saveri raga, set to Tishra Triputa tala. The Nayaka who would have lived and died an inconsequential life became Purandara Dasa, loved and revered even centuries after his death. Just as the sculpturers’ rock turns everything it touches into a figurine, the Lord took a wretched miser and made him into the doyen of all Hari Dasas. During the course of his wandering he met the holy Sage Vyasatirtha, Guru of Krishnadevaraya, the Emperor of Vijayanagara Kingdom. He had his formal initiation at the hands of Vyasatirtha in 1525. When he was about 40 years old, he was bestowed with the title Purandaradasa. Purandara Dasa traveled extensively through the length and breadth of the Vijayanagara Empire in Karnataka, Tirupati, Pandharpur composing and rendering thousands of soul stirring songs in praise of Lord Sri Hari. He sang in Krishnadevaraya’s Durbar and explained the essence of Upanishads, Vedas, in simple Kannada and used elements of colloquial language for his lyrics. He is widely referred to as the Pitamaha (the father or the grandfather) of Carnatic Music in honour of his significant contribution to Carnatic music. Purandara Dasa systematized the method of teaching Carnatic music which is followed to the present day. 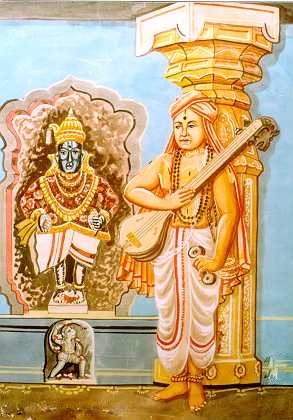 He introduced the Raga Mayamalavagowla as the basic scale for music instruction and fashioned series of graded lessons such as Swaravalis, Janta Swaras, Alankaras, Lakshana Geetas, Prabandhas, Ugabhogas, Daatu Varase, Geeta, Sooladis and Kritis. Another of his important contributions was the fusion of Bhaava, Raga, and Laya in his compositions. Purandaradasa is believed to be an Avatar of Sage Narada. 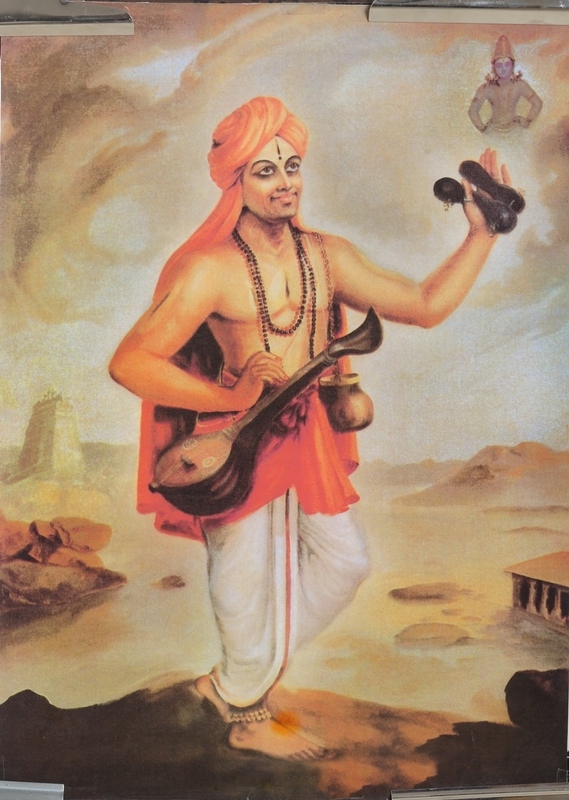 Purandara Dasa was the first composer to include comments on ordinary daily life in song compositions. He used elements of colloquial language for his lyrics. He introduced folk Ragas into the mainstream, setting his lyrics to tunes/ragas of his day so that even a common man could learn and sing them. Scholars attribute the standardisation of Varna Mettus entirely to Purandara Dasa. He spent his final years in Hampi. The mantapa (hall) in which he stayed is known as Purandaradasa Mantapa. Jai Pundalika Varada, Hari Vittala! The Lord reaches his devotees like Vaayu! 416. Adhokshajah – He who does not get diminished. Sri Adi Sankara gives the principal meaning as ‘Adho na ksheeyate jaatu yasmaat tasmaat Adhokshajah – His vitality never diminishes, and He is not diminished by repeated births and deaths, hence He is Adhokshajah’ (MahaBharatam Udyoga Parva 4.70.10). As a compound Nama Adhokshajah means ‘One who does not get diminished’. Taking Aksha (Heaven) and Ja (as born), Akshaja would mean One who is born in heaven. When we split the word into three parts as Adhah (Earth or below), Aksha (heaven or Sky) and ja (born) we get a different interpretation. Sri Sankara’s second interpretation is ‘Dyouh Aksham Prithvee cha Adhah tayoh yasmaat ajaayata madhye Vairaajaroopena ajaaya iti vaa Adhokshajah’ – He who manifests Himself as the Viraat between the Sky (aksha) and the region below (adhah) i.e., the Earth, in his Cosmic form referring to the Vamana/Trivikrama Avatar. Sri Parasara Bhattar interprets this Nama to mean that He never diminishes, just like the water from the Ocean never reduces or like the light from the Sun that never fades. Sri Radhakrishna Shastri adds yet another dimension: adhah – Jnaatritvabhaavaat heenam, akshajam jnaanam yasya sa Adhokshajah – He who cannot be recognized by Indriyas such as the eyes etc., even though He is everywhere and in everything. He is Omnipresent. In Bhagavatam (4.17.6-7) there is a reference to Adhokshaja – ‘Bhaktaaya me anuraktaaya tava cha Adhokshajasya cha vaktum arhasi yah aduhyad vainya-roopena gaam imaam‘ – I am always your devotee as well as a devotee of the Lord, who is known as Adhokṣaja. Please therefore narrate all the stories of King Pṛthu, who, in the form of the son of King Vena, milked the cow-shaped earth. Ettilum tannai Etta Etta engu eidum? Meaning: If I sing in his glory with all the three worlds joining me, and even if the Lord himself began to sing too, would we ever come to an end? Lord is sweet like honey, milk, sugar and ambrosia. I sang only so that I may rejoice. Bhagavan removes all obstacles to Liberation and hence He is Vaikunthah. He as Purushah is the Cause of Creation and He is the One who dwells within us as Antaryami, so He is Praanaah. As a life giver He is Praanadah and As He is Supreme all beings bow to him. He is worthy of worship for his great acts and is invoked with the Pranava Mantra ‘OM’ and hence He is Pranavah. He is Prituh as He is well known to everyone as the Supreme Being and the Creator. He resides in everyone’s heart as Hiranya-Grabhah and destroys all enemies, so He is Shatrughnah. He is full of love for his devotees and hence Vyaaptah. He moves like Vaayuh towards his devotees and He remains undiminished and complete, hence He is Adhokshajah. Very interesting and helpful narration and interpretation with word to word meanings.Thank you very much. I feel blessed to have found this site. Comments are not legible now I woner why? Greetings Mr.Sridhar! Your narration is very gripping and holds the reader’s attention.I have heard and viewed a couple of your links on youtube. Now for the first time viewing your blog in wordpress. Keep up the great job. Namaskara Guruji! It is very interesting to read from here. Today is my first day. I shall go back and read the previous parts too. In case you have any idea of publishing a book or you have already published, please let me know how I can pick up a copy. Thank you Guruji. Pranam! The book has not yet been published but will come about in the next couple of months. God bless you! Hari Om! Even as we watch, the water stored in a tank leaks through another outlet. In the same way, my life has been wasted without awareness of the ancient texts and scriptures, the Shastras and Puraanas. It is so true that we waste our life in unwanted things instead of concentrating on the Lord, without realising its all an illusion of his. Thank you Aishwarya! God bless you! Hari Om! Great share sir. Thank you. Thank you Tanisha 🙂 God bless you! Hari Om! Hari Om Sir! Very interesting narration and story. We are blessed to read from your blog. Hari Om! Thank you Nirmala ji 🙂 God bless you! Hari Om! Hari om uncle! My song teacher told me the story of Purandardasaru. 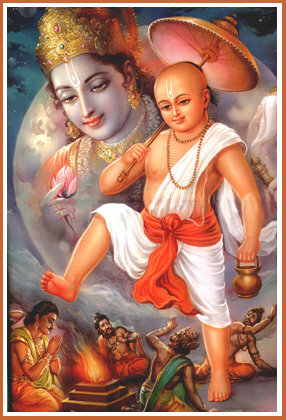 I like the picture of Shree rama. Very beautiful. My father always tells Sundara raman, that Rama is always very beautiful. I bow to Lord Hari who is called Rama. He is beyond all causes, to whose Maya this whole world as also the gods Brahma and others are subjugated, and due to whose essence everything shines as real (though in reality false), even as an illusory snake in a rope, and whose feet are, as it were, the boat to those who aspire to cross the Ocean of Samsara. Jai Shree Ram! Hari Om! Thank you Karthik 🙂 Much of it is due to my self interest to learn and imbibe this. Also, I must thank Shri Balaji who has been providing me with his regular support. I am happy that many of you find this useful. Truly blessed to be of some spiritual service.